Rocky Jordan was modeled on the classic, much revered movie Casablanca, which premiered in New York on November 26, 1942 and then in general release on January 23, 1943. Casablanca starred Humphrey Bogart as Rick Blaine, the American exile who ran Rick's Bar in Casablanca, Morocco, an unallied country during world War II located in northwest Africa, bordering the Mediterranean Sea. 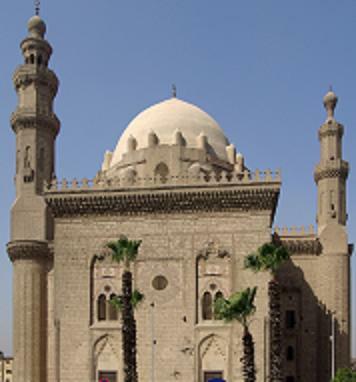 Rocky Jordan is set in Cairo, Egypt, in northeast Africa, said country also bordering the Mediterranean. Rocky calls St. Louis home, whereas Rick hailed from New York; both are intimated to have shady pasts. The counterpart to Rick's Bar is Rocky Jordan's Cafe Tambourine, not far from the "mosque Sultan Hassan," (photo at left) where Rocky finds himself routinely involved with "crime, mystery, and beautiful women." Much like Rick's Bar, set during WW II, Jordan's Cafe Tambourine, while set a few short years following the war, is a magnet for all ethnicities and types, from the respectable to the rogue. Unlike the rather semi-incompetent police official as stereotyped in the Sherlock Holmes tales, Egyptian-Muslim police captain Sam Sabaaya (married with four children) of the Cairo police is far more often than not Jordan's ready and more than competent ally. In this episode, "The Nile Runs High," which aired September 18, 1949, the storyline involves an egotistical outcast who forms an underground following in order to reclaim Egypt for his own--as supreme ruler. Rocky is thrust into the middle of this nefarious scheme of the would-be terrorist when he comes across a dead body on the Nile. Using detective work he discovers a plot to use improvised bombs using "gun cotton," which was, for the time, an actual bomb-making ingredient. The bombs are to be placed at strategic points on the Nile, shutting it down, and from which all commerce flows. Sound (as a general scenario) vaguely familiar? An outcast muslim turning to terrorism to achieve his ends by shutting down major commerce? In this specific instance, the parallel cannot be summarily ignored, and therefore as the old adage goes, the more things change the more they remain the same. Listen now as not only the tension, but "The Nile Runs High" in Cairo, ancient land of the Pharaohs, the land of adventure, danger, and mystery.